Kids will have a blast finally being able to "play with their food." Crazy Cereal is a fun hands on game where players will try to spoon up cereal based on the color that flashes on their spoons. It's fun and education for younger kids as they match colors and practice their eye/hand coordination. 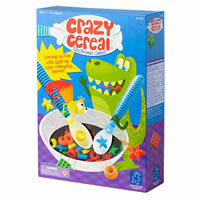 Crazy Cereal is sure to light up the eye of the kids as their spoons light up and keep changing colors. You'll have to take turns playing this game since only two can play at a time. Learn how to play below and have a good time playing with your child or let them play with a friend. If you can spoon the most cereal then you'll be a winner. You get 2 electronic light-up spoons, 1 shared bowl, 2 player bowls, 45 cereal pieces and the official Crazy Cereal game rules and instructions. 1. Players turn on their spoons at the same time. The scoop of the spoon changes colors. 2. Players pick up the cereal pieces that match the color of their spoon's scoop. 3. If it flashes quickly, the player has to pick up any 2 pieces at the same time. 4. The game ends once there are no more cereal pieces in the shared bowl. 5. The winner is the one with the most cereal. We are on the hunt for more information about Crazy Cereal but have not found anything yet. If you have any information regaring the Crazy Cereal game rules or instuctions let us know and we will add it to this page. We will post any updates to this page as soon as we find it. Crazy Cereal Children's Game rules and instructions. Share with us your comments, funny stories, tips, advice, strategies, creative ways to play, questions about how to play, problems with the rules or anything you want about Crazy Cereal. All submissions will be reviewed within 24 hours. Click here to add your Crazy Cereal comments.